Alderman Sage got Aldermen Bray, Mwilambwe, Painter and Schmidt to demand additional discussion with Police Chief Hefner. The discussion will take place sometime between 5:15 and 6:50 pm. They have a secret meeting to sneak in prior to this discussion. I don’t know anybody who has a problem with legal immigration, therefore no welcoming ordinance is needed. Tari doesn’t want breaking the law by over-staying visas or sneaking into the country to have any consequences. Of course, he has had no penalties for breaking FOIA law or the Open Meetings Act, he’s been taught that laws don’t matter. Tari wants taxpayers to fund social services, medical care, and schooling for people illegally squatting in Bloomington. What other laws should we pretend don’t matter Tari? Illegals can’t legally work, therefore they aren’t paying taxes, so what exactly are they contributing to the community Tari? Also at the 7:00 meeting is approving bike lanes on E. Washington. I wonder if Jim Karch has been told NOT to say they would create congestion. A public hearing will be held. Bike Blono will be there to demand their right to make vehicles slow down and your driving more dangerous. Who is coming to demand Common Sense? The documentation asks citizens not to repeat comments made at the Planning Commission since the Council has copies. We don’t know that the Council actually read those comments. The Council doesn’t get the passion of homeowners along E. Washington from reading comments. 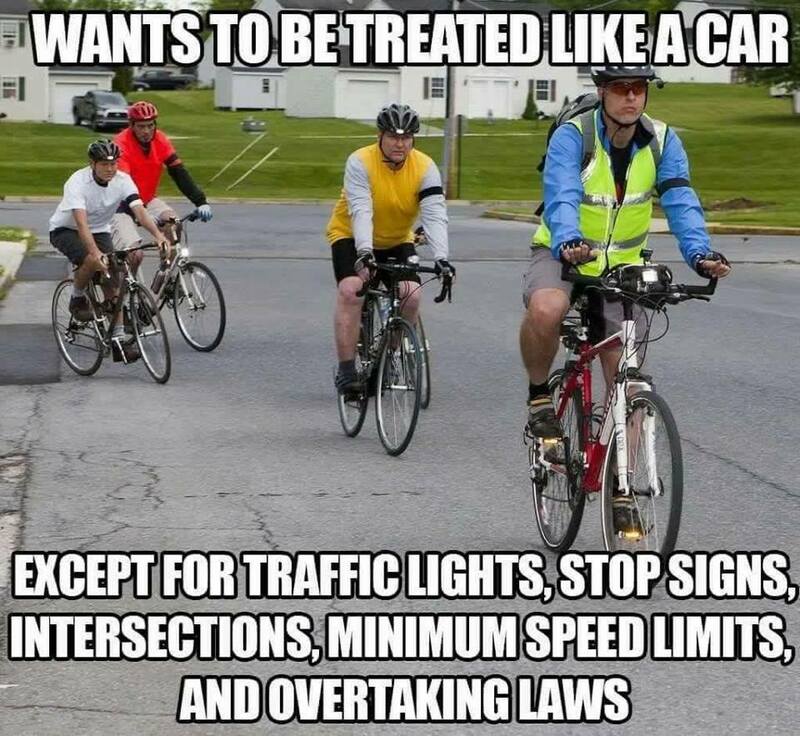 Citizens have a right to not comply, especially when Bike Blono thinks they have superior rights. Bills and payroll is again not posted. The Agenda has the total – $8,367,375.42 – so obviously Tari now wants payments to be a secret until after the meeting. Some pesky citizen might question the squandering of taxpayer money. More transparency! Now that Illinois is stealing more money from its people, Bloomington revenue won’t be flat – it will decline. Expect Tari to fleece more soon. In Illinois, government doesn’t know how to live within their means, say no to anything, or be fiscally responsible. Basic Economics: Tax revenue is generated by dollars spent. When people have less money because government seizes more, dollars spent decline – therefore tax revenue declines. The above is also the reason why tax cuts always generate more revenue. Obviously intelligent review of history and government policies aren’t compatible. Posted in BloNo, Bloomington, debt, Hales, illegal immigration, Local, Progressives, Renner, State, Taxes.Tagged Bike Blono, bike lanes, Bloomington Police, create congestion, E. Washington, government theft, illegal immigration, Illinois, welcoming ordinance. “If you like your street, you can keep your street.” Renner is Obama light, following a socialist, marxist, deceitful full of himself mantra. Knowing the area, it is easy to project the congestion at Washington School when all the parents start showing up in their cars to pick up their kids. The circus will begin with Bike BloNo featured as the main side show attraction once the parents realize what is really happening and the children have to navigate their young selves through that traffic congestion. I am not liking the potential of this scenario and the increased chances of a child being hurt. Bike BloNo is a small bunch of selfish idiots. No clue, no concern for others safety, none. What people should be outraged about concerning Bike BloNo’s proposed amendment to the Bike Master Plan is that the decision was made behind closed doors long before the Public Notice for the Planning Commission was published in the Pantagraph in May. The packet for Monday’s Council meeting includes the Resolution to Amend with the date of adoption typed as July 10, 2017. Note, today is July 7, 2017. The Resolution to Amend presented to the Planning Commission on June 14, 2017 also had the date of adoption as July 10, 2017 and the date of approval as July 11,2017. All public input was ended as of June 26, 2017 except for a 17 page tome written by Mike Gorman on behalf of Bike BloNo pre-dated July 10, 2017 which is included in the packet. Again, note, today is July 7, 2017. There doesn’t even seem to be an effort made to pretend to be transparent anymore. The Bike Amendment and Welcoming Ordinance are political. So is the topic of the Special Meeting. Oh please that on pages 465 and 466 what a crock of …….. I see no mention of working cooperatively with the federal government also. Is Bloomington trying to be the Jewel of the midwest sanctuary city? “Jewel”….. ROTFLMAO on that one. Now I see that Sears/Kmart is axing 43 more stores. I’m sure Bloomington has moved up on the list….closer to the top. Any day now. Sears is hoping to corner the market once everybody else is gone. Anyone who comments on the “welcoming” ordinance–submitted by Renner–will be labeled as a racist. Who cares? The term is now meaningless since they call everybody a racist. It no longer has any validity. Does that include blacks & hispanics? My guess there are blacks & hispanics out there who disapprove of this as well! July 18, 2017, Attorney General Jeff Sessions announces that with the goal of ending illegal immigration an additional 10,000 ICE agents will be hired and deployed in sanctuary cities. I hear all of State Farm’s H1B visa holders have to leave by the end of the year. Renner mentioned some are here on expired visas and they are scared. Is Renner planning on protecting them? Wonder if that includes Vasu? Previous Post Normal: Forget something last night?